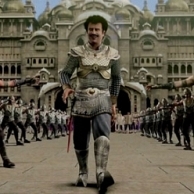 Superstar Rajinikanth’s Kochadaiiyaan hit the screens yesterday 23rd May to a thunderous response from the audience. The film is the first full-length Indian animated movie on performance capture technology. The 2D and 3 D versions have been lapped by the audience and the film has also received the entertainment tax rebate. While Kochadaiiyaan is garnering all positive feedbacks, there are few quarters who have been saying negative things about the animation in the film. Reacting to this actor/director/dance choreographer Lawrence Raghavendra says, “Even if superstar comes in an animated avatar, he is SUPERSTAR only. This film will be a milestone in his career”. He also applauded Soundarya saying that her work is commendable although she has not worked as an AD under anyone. Vishaka Singh or Salma Hayek? Kochadaiiyaan – What the industry thinks! 'Thala 55' is officially Cool. People looking for online information on Kochadaiyaan, Raghava Lawrence, Rajinikanth will find this news story useful.